Live chat (or web chat) technology dates back to the 1990’s, but it only became mainstream in the last few years. It has now surpassed the phone call as the preferred customer contact channel for most people under 35. But time waits for no technology. Live chat may find that it has a short spell in the limelight due to the poor experience it offers on mobile devices and in a multi-device world. Live chat was designed for a web being surfed with PCs and laptops; not smartphones. Today 72% of browsing time is done on mobile devices. It is not surprising then that messaging, a technology born in the mobile era is already making live chat look dated. why messaging works so well when customers are switching between devices throughout the day. One of the great mantras of tech companies over the past 10 years has been that they are building a “mobile first product”. Messaging, as a technology, makes the same claim. It was built for mobile and owes its origins to SMS. WhatsApp's initial traction was primarily driven by the consumer's desire to avoid SMS charges. This largely explains why WhatsApp has struggled to make an impact in the USA. SMS were already free when WhatsApp launched in its home market. That was not the case in most of the rest of the world. Scanning the messaging app ecosystem, nearly all of the leading players started out on mobile (WhatsApp, Messenger, WeChat etc.). This explains why the messaging interface works so well on mobile devices. Live chat, on the other hand, is rooted in the desktop era. The way it works is ideal for a situation where someone is sitting at a desk for an extended period doing little else other than waiting for the next response. the user is presented with additional functionality on Messenger (e.g. the persistent menu), which enable them to manage messaging and self-serve. So even the best live chat solution for mobile cannot compete with messaging from a customer experience perspective. In a similarly mobile-centric way, messaging accounts for the fact that we use our smartphones on the go. We use our phones in spurts between other activities, unlike when someone sits down in front of a desktop for long periods. We also move from one device to another (e.g. iPhone to iPad to Mac) in the space of a couple of hours. Continuing conversations across devices is easily done with Messenger and Twitter for example, while it is extremely difficult (impossible without SMS or email?) with live chat. Web chat’s requirement for a live experience also works against it on mobile. For example, phone calls take precedent over live chats on a smartphone. That means if you linger on the call the agent will probably terminate the chat due to inactivity, which means you’re back to square one. Even where there is a persistent connection via web chat, you need to remember to go back to the chat after the call (i.e. navigate back to the correct tab on your browser). Messaging, on the other hand, fits into the busy lives of both customers and time poor small business owners, allowing both parties to send messages when convenient. In larger businesses with call centres, asynchronous messaging means consumers can start a customer conversation whenever and wherever it suits them (e.g. on their iPad at 11pm as they get into bed), while the customer service agent can respond when available. This minimises stress and frustration for both parties, as customers are not left on hold and it smooths the agent’s workload throughout the day, which is more efficient for the company. The big difference here is that the customers contacting the business during the blue sections of the chart will eventually get a response within the same messaging app, along with a notification to make them aware of it. However, on live chat the customers in orange may have to wait for an agent so long that they have to abandon the chat, or alternatively leave their email address and enter the spammy world of customer service via email. On most live chat services the customer only gets their chat transcript if they request it via email. Where the problem has been solved using cookies etc., web chat fails to retain the chat history when moving from one device to another. This means that there may be a lack of context in follow up interactions. Messaging, on the other hand, retains infinite chat history of the conversation between the user and the business regardless of what device is being used. This not only helps avoid confusion about what was said, but it also enables the user to refer back to previous solutions or links to tutorials that resolved a similar problem in the past. As I mentioned at the start, web chat has been around for a long time and, although it has always been improving, the core feature set and tech has only seen marginal improvements in the past few years. Areas, where web chat might have had an advantage, are being relentlessly eroded. For example, Facebook recently introduced referral parameters to enable businesses to identify what page the customer is on so that the agent can provide contextual assistance. 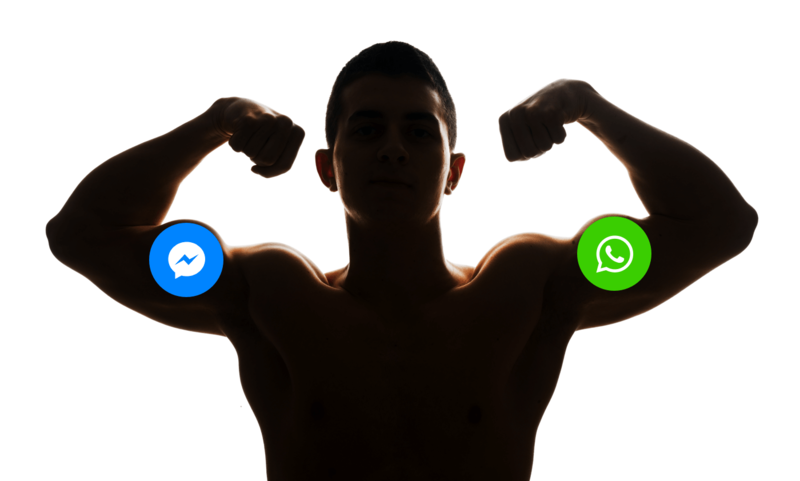 The fact that all Facebook users now have a Messenger.com account means messaging apps can offer an equally great experience on desktop. With the number and quality of developers working on bots and the messaging platforms themselves, the capabilities of messaging apps in a customer service context are only going to get better. This is an innovation battle live chat has no chance of winning. WeChat, China’s leading mobile app, is the primary channel via which the majority of the Chinese population interact with businesses online and is indicative of how messaging can become a whole new commercial interface between consumers and businesses (check out our series on WeChat here). The challenge in the West is that we don’t have a completely dominant messaging app like WeChat, but products like ServiceDock will enable businesses to support customers regardless of their preferred messaging app. The messaging app as a platform for commercial activity and customer service is here today and early adopting companies will be best placed to create a strong competitive advantage. So start working on your messaging strategies today instead of trying to figure out what the best live chat solution for mobile devices is.